This majestic rhinestone will give a sense of richness and royalty to your Christmas wedding invitations and other wedding bling. Its warming golden sparkle will melt the hearts of your guests, whilst the crystals catch the spirit of a still and silent frosty wonderland. These splendid rhinestones can be used for anything from a scrapbook decoration to a seasonal hair accessory to memorable snowflake wedding invitations. It was the exact piece needed.. 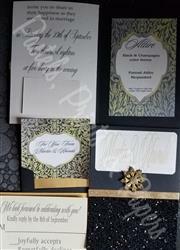 The invites were set off perfectly by the embellishment. The bride and groom both were so pleased with the finished product! I ordered the brooches last minute and Christine did everything she could so my items could ship out to me by the next day, and of course they were beautiful as usual. What beautiful pieces!!! The flat back pieces added that final touch to the corsages. Needing something special to add to a wedding gift wrapped in gold & white foil paper, I hot glued this beautiful flat back snowflake to a big bow, & the couple went bonkers over the beauty of the wrapped gift...saying that it was too pretty to even unwrap! The color of the brooch is vivid, not cheap looking at all, and it's large enough to make a fashion statement. I've ordered more flat back brooches to glue on my holiday shoes to wear to Christmas and New Year's parties. The price is right, and the service/follow-up is superb.